The important thing to know before seeing One Man, Two Guvnors is that nearly everyone in it is an idiot. Once you know that, it’s easier to just enjoy what happens for all the silliness that it is. And depending on where you sit, you may end up being part of the action! Written by Richard Bean and performed on the West End and on Broadway from 2011-2012 starring James Corden (he won a Tony Award), One Man, Two Guvnors tells the story of Francis Henshall and the mishaps that arise when he works for two employers and proceeds to mix up everyone’s letters and wishes, all while he is feverishly looking for a meal. 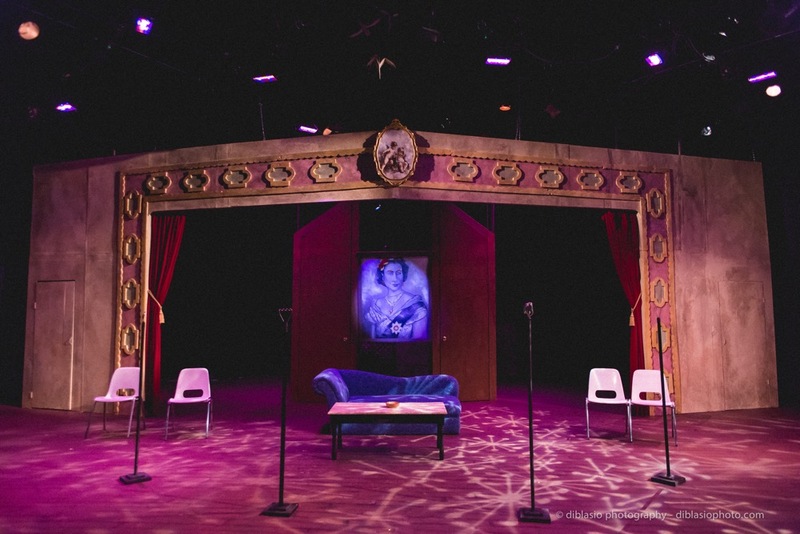 There are gangsters, a ditzy debutante, and mistaken identity thrown into the mix, and there are even a few songs harkening back to the English music hall tradition, to which this show pays homage. The plot is secondary to the style and engagement of the production, which is designed to bring a few special members of the audience into the action, the results of which are quite funny. The audience rocked with laughter at the performance I attended, no question. Ryan Metzger plays Francis Henshall, a powerhouse of a role as it requires Ryan to run about the stage and theatre for nearly three hours, improvise with the audience, and take plenty of pratfalls and abuse to his groin (some self inflicted). The show rises and falls with him, and luckily in this case it rises most of the time. The few moments where it seems to lag are when he isn’t on stage to propel the action. The rest of the cast is mostly fine, some of their English accents better than others; honestly, the worse the accent, the funnier the play was to me. Two of the ensemble cast members stood out from the pack – Katrina Colletti and Kayla Walsh. Katrina Colletti (Pauline) plays bubbly and sweetly moronic with ease, and she and Kayla Walsh (Dolly) wear the ’60s hair and costumes like they are going to battle. Kayla is especially endearing as one of the few non-idiots in the play, but that doesn’t mean she isn’t a delight as she wriggles across the stage in her improbably tight skirt and high heels as a more intelligent Mrs. Wiggins from The Carol Burnett Show. Katrina and Kayla I hope to see more of in the future, perhaps teamed in a musical version of Cagney & Lacey or something. This was my first visit to the Weathervane Playhouse in Newark, Ohio, and it was more than worth the effort on such a rainy Saturday afternoon. The complex has two buildings, one that appears to be for children’s programs and shows and the other for their main productions. The seats are comfortable and the sound surprisingly good, and this play brought the actors into the audience quite a bit, which everyone seemed to love; I admit that I even fell for some of the schtick, though the play is of the kind of slapstick comedy variety of which I’m not especially fond. I’m very excited to return to see what they do with The Pajama Game in a few weeks. 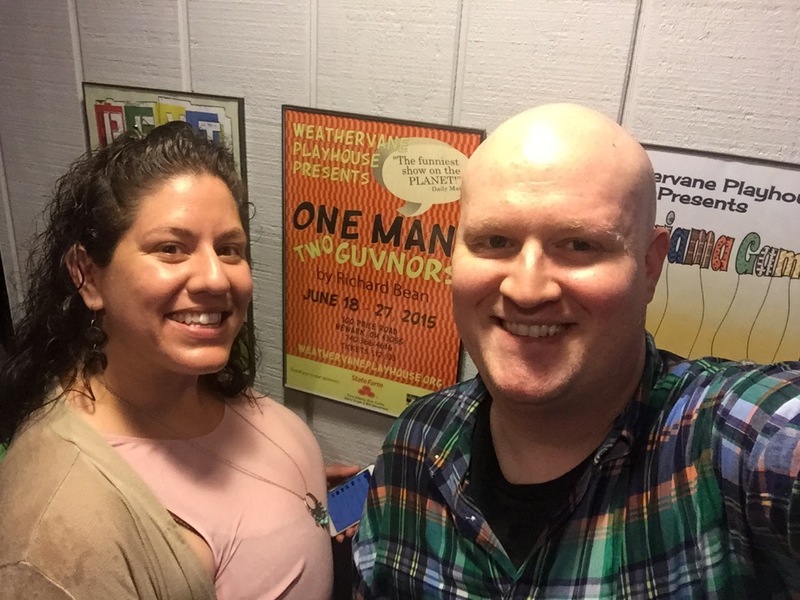 The Weathervane Playhouse production of One Man, Two Guvnors is an experience more than a literate play, and I doubt you could find anyone at the performance this past Saturday matinee that didn’t have a good time, myself included even if the style of the play wasn’t to my taste. Deyannira Tirado and I at the play.